Sony Pictures has announced the release date and details for their blockbuster film Spider-Man: Homecoming. The film will first be available in digital formats on September 26, followed by 4K Ultra HD, 3D Blu-ray, Blu-ray, and DVD on October 17. 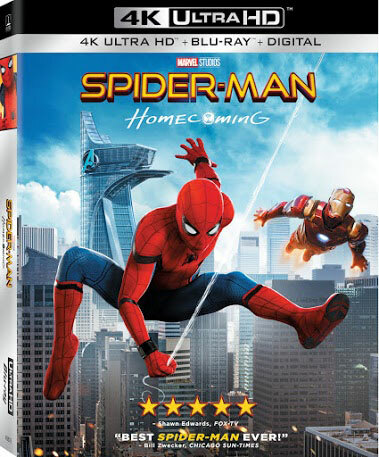 The Blu-ray editions of Spider-Man: Homecoming feature over 60 minutes of bonus material such as deleted scenes, a gag reel and the “Spidey Study Guide” with facts about the movie and comic books. There are also 4 never-before-seen alternate Captain America PSAs with Chris Evans, 7 behind-the-scenes featurettes, and a photo gallery.